A few years ago I ran the kitchen of a wonderful cafe called Little Nest. It’s a small restaurant with a full kitchen that makes only breakfast and lunch, and about half the menu changes daily. I had never run a kitchen before, never written my own specials before, never done the ordering before, never done the hiring before. To say I was in over my head was a serious understatement. And while everyone was very patient in my slow understanding of how it all works, it’s important when your feeling entirely under qualified for a job to have a trick or two up your sleeve. I call this the Amelia Bedelia. You know the kids book about the maid who takes everything literally? She puts sponges in sponge cakes, and when asked to dress the turkey she puts it in childrens clothes. She absolutely makes a mess of her employers house BUT she always has just a little bit of extra time and she always bakes the most amazing pies. So. When the Mr. And Mrs. Rogers come home and freak out they eat the pie and all is forgiven. I think this book had an alarmingly large effect on me as a child. So at Little Nest my Amelia Bedelia was pasta. It changed everyday but it was always dang good. And I gave one to the owner and manager nearly every day for a month and they decided I would be okay in the end. So for the last few months I’ve been running on nearly nothing but adrenaline because I’ve been working so much and I will admit some very stupid mistakes have been made. 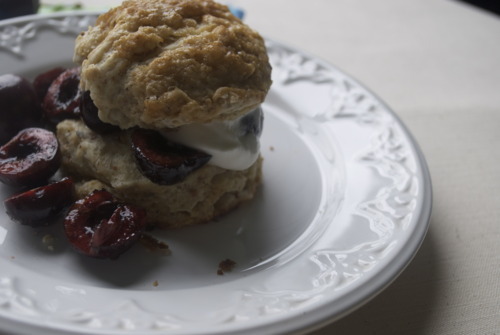 Silly silly things, so silly I’m to embarassed to tell you, BUT fortunately I make killer scones. You know, they are super light and fluffy and with layer upon layer of butter flakeyness and that my friends, is my Amelia Bedelia. Even though, my boss certainly doens’t always notice them, I do, and it give me the confidence when I feel dreadful (and maybe put coriander into the 10 times batch of cardamon cookies accidentally) I know that at very least I can do one thing very well. And that means that with some practise I can do other things very well. 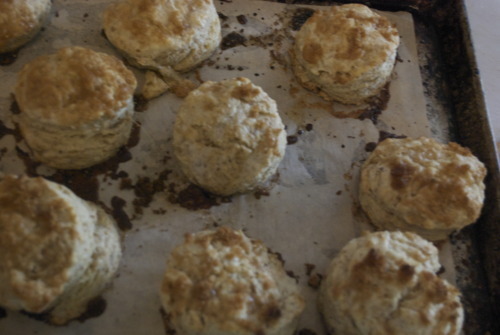 So, now that I’ve quit my second job and am focusing on not making stupid mistakes at the one job that’s actually important to me, I thought I’d make some scones for a girlfriend who came over for brunch the other day. 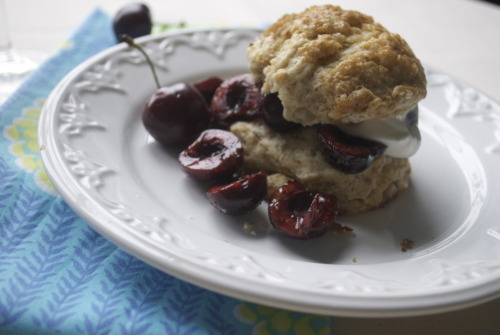 Light fluffy, flakey scones, these ones full of hazelnuts and then cut in half and stuffed full of fresh cherries and whipping cream. Because if that isn’t going to save your job and make you feel a hundred times better, well, I don’t know what will. 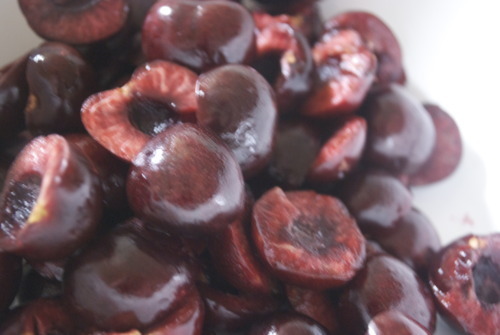 1 1/2 cups Good, Ripe Cherries, cut in half and pitted. 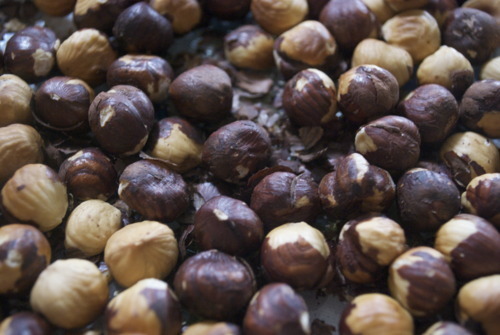 Put hazelnuts in a single layer on a tray and bake until they turn a pretty auburn colour and smell very fragrant. Using a towel try to scrub off the loose pieces of skin. 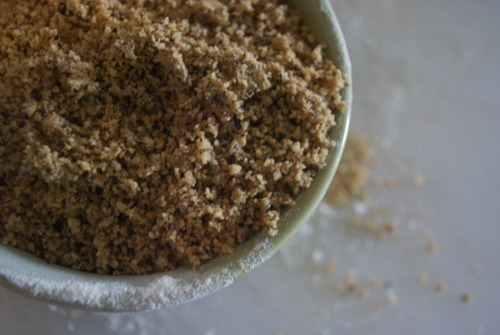 Grind them up very fine in a food processor and then measure out 1 cup. 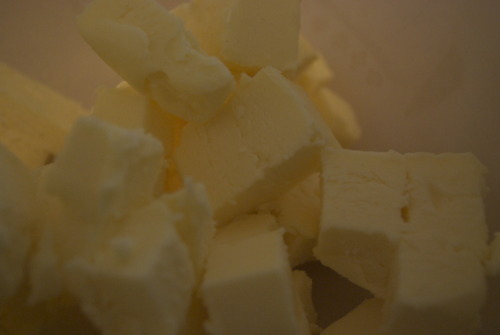 In a bowl mix all the dry ingredients and then cut in the butter, breaking it up with your hands until the butter is in chunks, roughly the size of your baby fingernail. 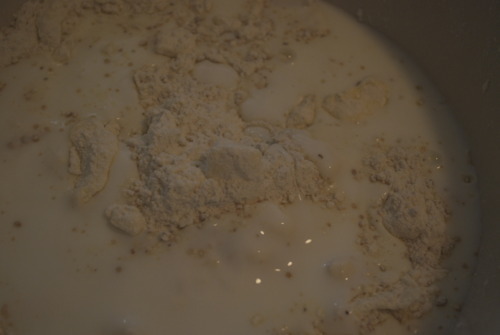 Pour in the buttermilk and mix gently until it is almost combined. 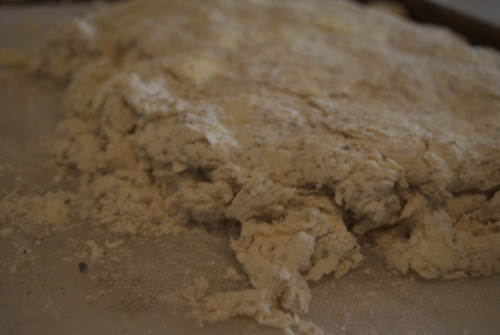 Then put it out onto a cutting board or counter and gently push it down, fold it in half, push it down, fold it in half until your dough is cohesive, but not at all tough. As soon as you start to feel a resistance, stop. Cut into circles and put on a tray, then put the tray in the fridge to cool for at least 20 minutes. 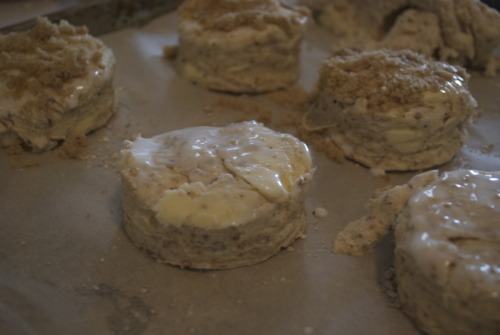 You get nice flaky scones because the big pieces of butter which are very cold go into the hot oven and the change of temperature makes the butter produce steam which causes the layers. So it’s important to let them chill. Brush with a little extra buttermilk or cream and sprinkle some brown sugar on top if you’d like. Get them into that oven right away and bake until the tops are nice and brown. 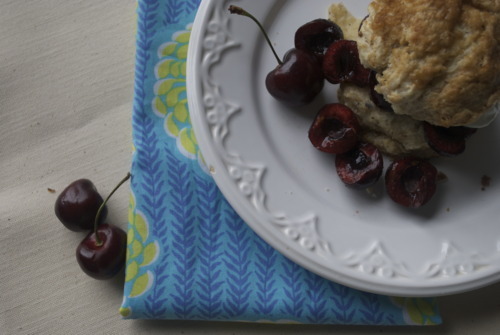 Meanwhile mix those cherries and sugar together and them sit and meddle and be happy together. 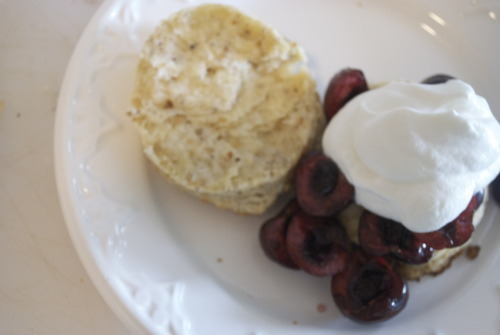 And then break a scone in half, plop some cherries down put a dollop of whip cream on top and top oit with the other half of scone and hot damn thats a good breakfast, lunch, or dessert.